The most common type of knee arthritis is knee osteoarthritis. Knee arthritis is a disease that affects the cartilage of the knee joint, which is a shock absorbing smooth surface that covers the part of the bones that move against each other in the knee joint when you move your leg. This allows smooth pain free movement of the knee joint. In an individual with knee arthritis, the cartilage breaks down and wears away, losing the shock absorbing smooth surface between the bones. As a result, the bone underneath the cartilage rubs together, causing pain, swelling and loss of knee mobility, as well as development of little bony protrusions called bone spurs. 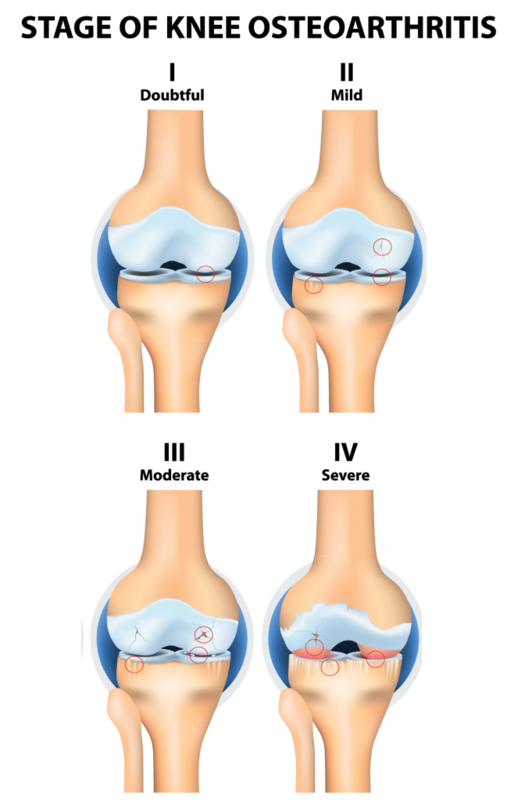 The development of knee arthritis is a process that occurs over time. There are several factors that make people more susceptible to developing knee arthritis. These increased increasing age, being over-weight, a previous knee injury, and engaging in repetitive activities (ie. Running) that put added stress through the knee joint. Individuals with knee arthritis commonly experience knee muscle weakness and pain with weight-bearing activities such as kneeling, squatting and walking up and down stairs. Knee stiffness, swelling, clicking and pain first thing in the morning or after periods of inactivity is also commonly felt in people with knee arthritis.